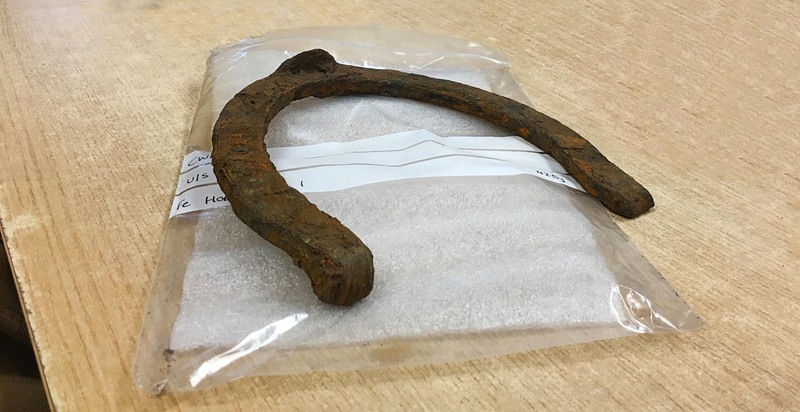 This massive horseshoe (189mm toe to heel, 194mm wide, 682g) was recovered from a disused lead mine in Northumberland. Unlike the pit ponies that are commonly associated with mines, this would have been made for a large draft horse, capable of pulling loads of hundreds of pounds all day on its own, or several tons when working in a team. This fullered shoe has calkins on the heels (one since worn down) that extended down from the shoe into the ground to aid traction, and a toe-clip coming up from the shoe to support the hoof. Toe-clips came into widespread use on heavy horses in Britain in 1825-30, and were sometimes extended around the whole front of the shoe, then known as a bar-clip. 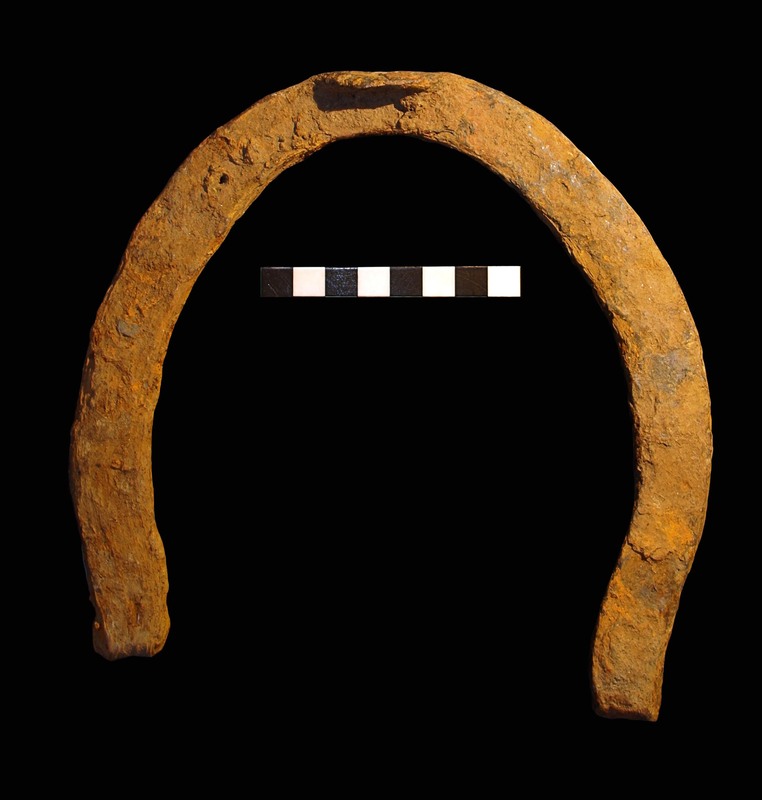 This massive horseshoe (189mm toe to heel, 194mm wide, 682g) was recovered from a disused lead mine in Northumberland. Unlike the pit ponies that are commonly associated with mines, this would have been made for a large draft horse, capable of pulling loads of hundreds of pounds all day on its own, or several tons when working in a team. This fullered shoe has calkins on the heels (one since worn down) that extended down from the shoe into the ground to aid traction, and a toe-clip coming up from the shoe to support the hoof. Toe-clips came into widespread use on heavy horses in Britain in 1825-30, and were sometimes extended around the whole front of the shoe, then known as a bar-clip.